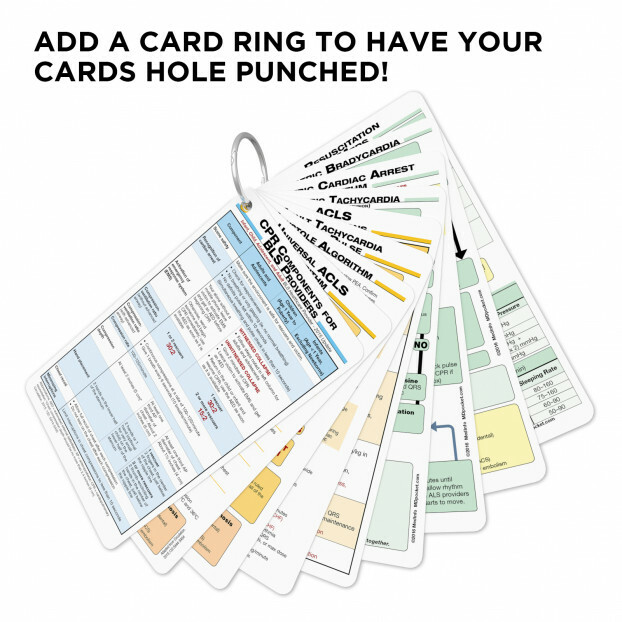 MDpocket 2019 ACLS pocket reference cards are ideal for quick review of the ACLS algorithms and are updated to the latest guidelines from the American Heart Association (AHA) for Cardiopulmonary Resuscitation (CPR) and Emergency Cardiovascular Care (ECC). These cards are used every day by healthcare providers throughout the United States and were first published in 1966. Since that time, periodic revisions of the ACLS guidelines have been published by the AHA with the latest guidelines. MDpocket has compiled the AHA guidelines to provide a comprehensive review of evidence-based recommendations for resuscitation and emergency care with easy-flow algorithms to guide you through each critical situation. Our four-card six algorithm ACLS pocket reference set includes recommendations on ACLS pathways for treatments and algorithms for Pulseless Electrical Activity, Bradycardia, Pulseless Ventricular Tachycardia/Fibrillation, Asystole and ACLS medications. This set is great for studying the ACLS guidelines or having them available when you need it most.